You *can* use a generic QFN breakout board, with drag soldering, assuming it has a hole in the back so you can melt the solder for the exposed pad. It would be hard, though. Not for the feint of heart, shaky of hands, or poorly equipped. Do not forget the 0.1uF decoupling cap between Vcc and Gnd, which needs to be as close to the chip as possible. For prototyping: use the DIP8 package. Or SOIC8 on DIP8 breakout board. 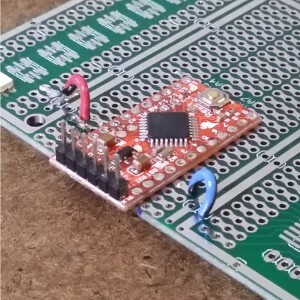 Then when you're ready to go for custom PCB you can design your PCB for the QFN package, and solder that on (quite straightforward when doing reflow, which is what they're designed for).